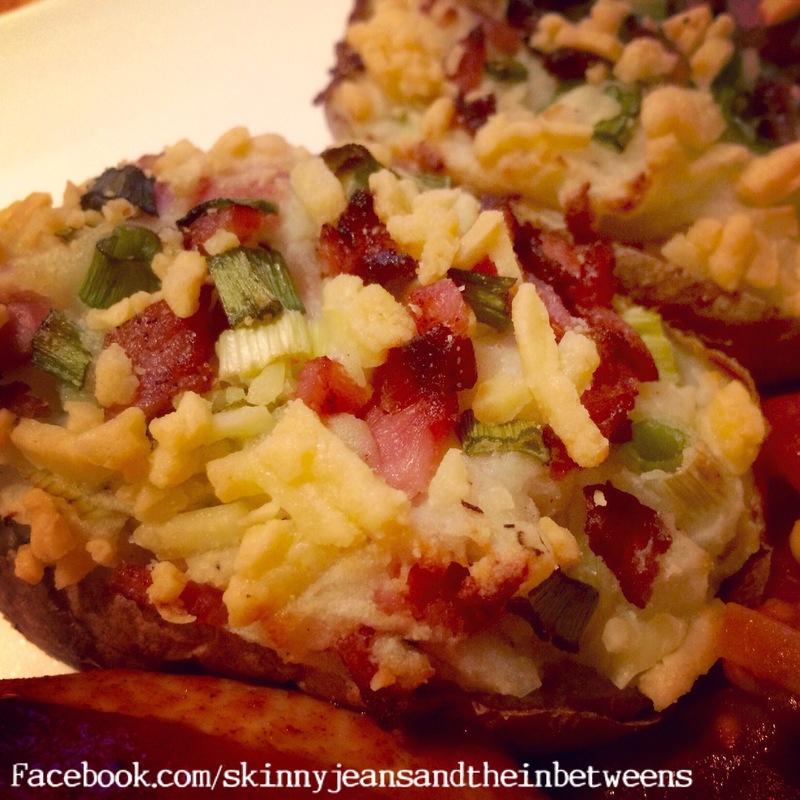 Wash the Potatoes & place in a preheated oven at 200c and bake for an hour. Remove & leave to cool for about 20mins. Cut in half lengthwise & carefully scoop out the Potato Flesh into a bowl & mash together with the Sour Cream with a fork. Meanwhile Fry the Bacon in Frylight & cut into small pieces. Slice the Spring Onions finely & add to the Potato Flesh with the Bacon & Season well with Salt & Pepper and fold into the mash. Spoon the mixture back into the Potato Skins & top each 2 halves with 10g Cheddar. Place back into the oven for another 20mins or so or until reheated well. For the Chicken mix all the ingredients in a bowl & score each Chicken Fillet on the top with a Sharp Knife. Place the Chicken in the Marinade & leave for 20 minutes or so to marinate. Place the Chicken into an ovenproof dish & pour any remaining marinade over the Fillets. Bake for approx 25 minutes or until the Chicken is fully cooked through. 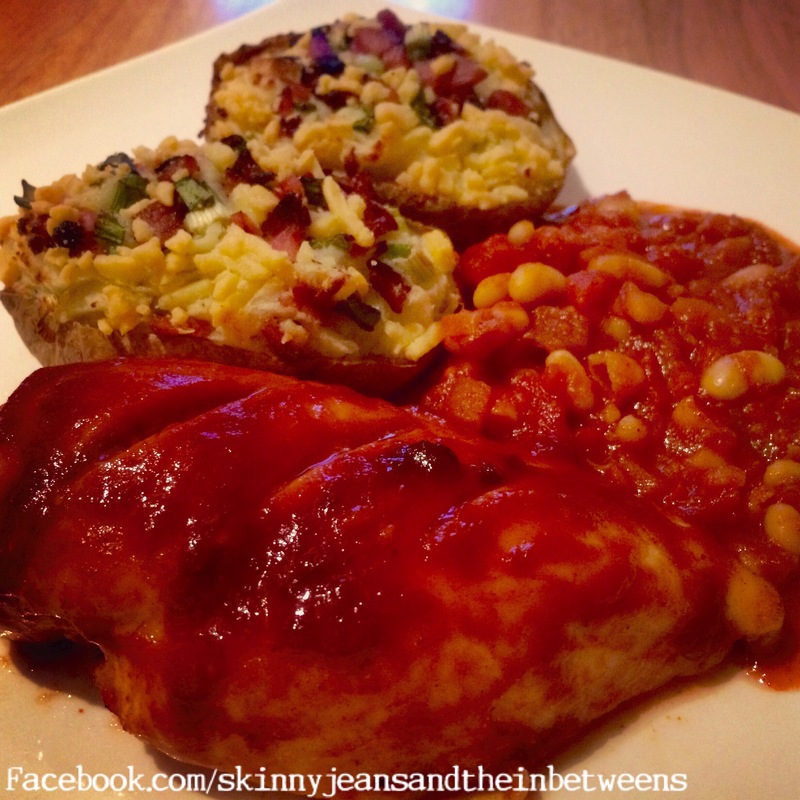 Serve with the Twice Baked Potatoes & Heated Beans & Enjoy!